During my time as a student at Busselton Senior High School in the late '60's I met Peter Strain. Peter has remained in contact, and is now recognised as one of Australia's leading documentary makers. He lives in Broome, which many claim is just a stones throw from Heaven. 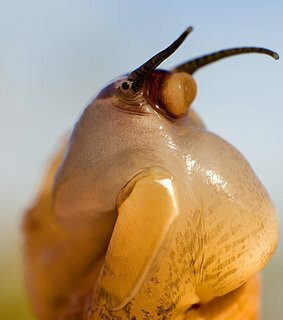 This little creature is actually the size of a fingernail and lives in the intertidal zone near Broome. Here is an unashamed attempt to get you to put my name on your computer. It is a picture from my "Creatures of the Giant Tides" collection. Please use it as a screensaver. Download it or just open it and then right click on it and choose "Set as Desktop Background"
If you like it, I will give you another one when you are sick of this one. Look at the selection on my website www.broomepictures.com.au in the "Creatures of the Giant Tides" gallery. You need to view the website to understand the range of these creatures. While people have been busy creating animated creatures for film and TV – I have been finding them in nature along the Kimberley coast from Broome to Koolan Island.